For thirteen years, Guerrilla Games have been tied to the Killzone IP. I’ll never hide the fact that I’m not a fan of Killzone. It also left me with a perception of Guerrilla that was all wrong. I’d come to believe they couldn’t make anything other than a generic FPS. They were stuck repeating themselves in one single franchise. As with every studio, I wanted them to branch out and make something, anything fresh. Something new. Welcome to Horizon Zero Dawn, the game that makes it all worth it. Horizon Zero Dawn changed my thoughts on the studio but it also brought some much vindication to me wanting the studio to branch out. It’s time to live amongst the machines, explore post-apocalyptic Colorado and fight for your tribe. Open world games are in vogue. It wouldn’t be an exaggeration to say that every genre, series and developer is going open world just for the sake of ‘content’. The problem is that most just can’t seem to give the content any meaning. That Ubisoft Game© just throws in random collectibles that have no real place in the world they’ve created. No Man’s Sky decided that world, with more worlds littered with random content. Guerrilla haven’t made an open world game before, so it’s just a pleasant surprise that they’ve done so well. The epitome of a great open world game is The Witcher 3. The world is both packed full of content, but the content has meaning. While not on the same scale, Horizon Zero Dawn comes extremely close to this level. It hasn’t completely ignored the tropes of the open world game, featuring its own climbing towers to reveal sectors of the map. That’s one of the strange things about Horizon, as much as I absolutely love it, there’s little doubting that it borrows a lot from other games. One part Far Cry and two parts Tomb Raider. Throw in a dash of Cinnamon and Ubisoft and you’ve got Horizon Zero Dawn. Hunting a myriad of animals for crafting purposes felt like it fell right out of Far Cry. The excellent archery based combat, with the spear and a number of alternative weapons makes for incredibly interesting fights. 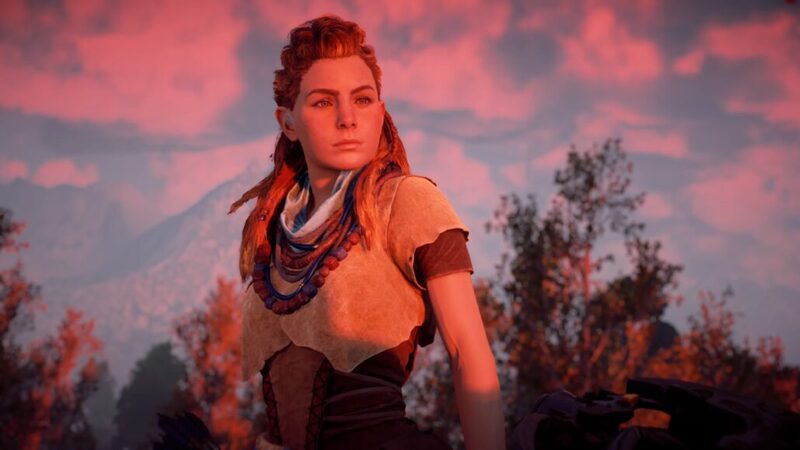 Most important is the outstanding character that is Aloy, her development and the path she takes. You follow Aloy from day one of her childhood who is an outcast of the Nora tribe. This is the world she lives in. Humankind has fallen, the world has changed dramatically and the machines that people used led them to become weak. The problem now is that over the years something has changed and machines now attack people. Watch as Aloy learns and grows under fellow outcast Rost. She trains for the proving to become a full member of the Nora. To win the proving would also let her finally learn why she was born an outcast. The tutorial isn’t really needed that much as a means of learning to play. Everything plays like it’s come out of other games you’ve already played. No matter how much it borrows from other games, it works well simply because of how well developed the world is and how interesting the enemies are. Machines that roam the world are hugely varied. From Grazers, deer like machines, which will run away as soon as they spot you. Shell-Walkers, crab machines that carry cargo on their back. There are also giant monstrosities like the flying Stormbird or the ground-based Thunderjaw, both incredibly fearsome and terrifying to any who oppose them. What makes the combat even more compelling is the excellent AI. You can use the stealth mechanics to take the first few shots, but very quickly the machines will learn where you are and either explore or, in the case of those with ranged weaponry, take shots in the hopes to rooting you out. Once the machines find you, that’s when you need to worry. Some, such as the Scrappers, hunt in packs and will almost corral you, backing you into a corner before attempting to finish you off. Adding onto this is the compelling nature of combat against the more complex machines. There are distinct parts of their bodies that are weak to alternative weaponry where attacking them and causing enough particular damage will either cause them to fall off, limiting the machines offensive capabilities, or even causing them to self-destruct. One perfect example is the Bellowback, a giant elemental machine with ranged attacks. Should you do enough damage to its gullet, then it will overload and explode, causing a large amount of damage while preventing any future ranged elemental offence. Taking advantages of these weaknesses, as well as the AI of the machines comes through the variety of weapons Aloy has at her disposal. There are three types of bow, from basic hunting to a sharpshooter or elemental offensive war bow. You use metal scraps of metal to buy weapons, traps and potions from the various traders across the world. Other items you loot from your kills can also be used to craft the ammo, traps and potions to be used at your discretion. As much as the problem of crafting, of having to hunt particular small wildlife and collect random shrubbery could feel like a chore just for expanding the backpacks for different ammo types, it never does. This is primarily due to the extremely well-realised world that the game takes place in. Too many feature wide, expansive areas that just feel like the same but copy-pasted ad infinitum. Where Horizon Zero Dawn actually finds itself most boring is also in combat. This is against other humans. Of course, the game would have you fighting against other humans, from raiders to other more aggressive tribes. It’s strange that the people you fight against are actually less intelligent than the machines. Easy to handle, manipulate and trick, the only time fighting people tends to be interesting is if you challenge yourself to conquer the few bandit strongholds without raising any sort of alarm. 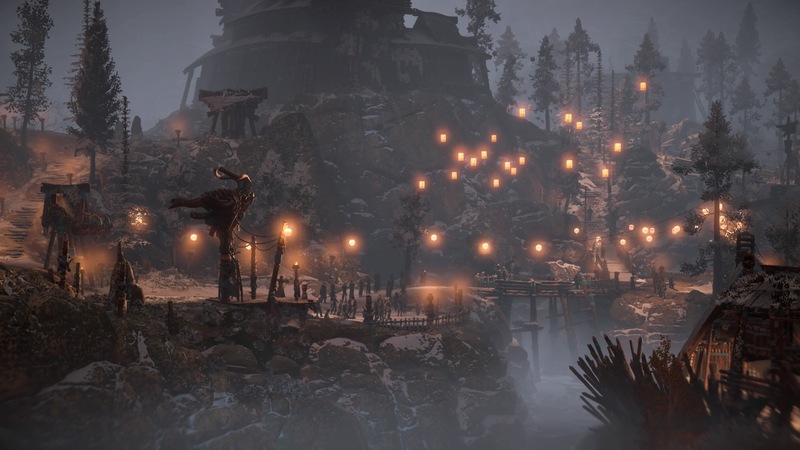 The world of Colorado, where Horizon Zero Dawn takes place in, features a host of terrain. The terrain ranges from lush woodlands, idyllic grasslands and scenic snowy peaks which offer some of the best scenery in gaming today. It’s both beautiful to look at and outstanding to explore. 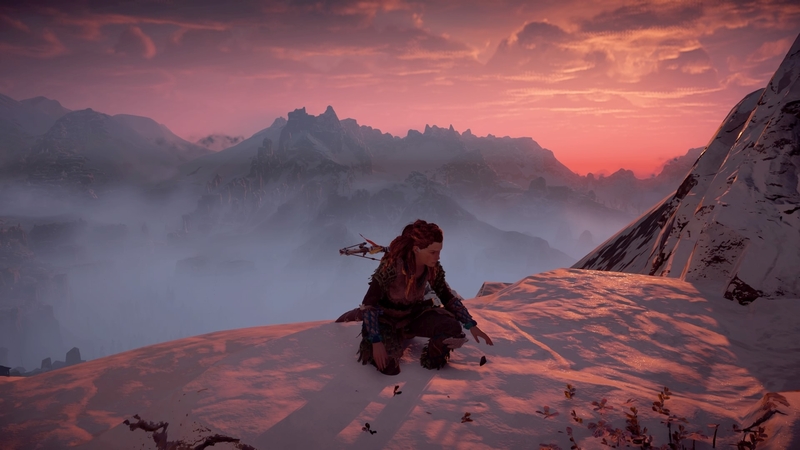 The view of a sunrise, the light cascading along the mountains, highlighting Aloy as she rests atop the snowy peak, looking over the land forbidden to all Nora by the Matriarchs who rule the tribe. This isn’t to say it’s all perfect. As great as the world design is, character design falters at times. Aloy is outstanding, as are the few other main characters. Those you encounter on the way as random NPC’s; the traders, those giving out side quests are less distinctive. Not quite as doll-like as Bethesda games they haven’t quite escaped the uncanny valley just yet. They’re getting there, just a little more care and attention needed. It’s a surprise since the side quests tend to be well realised and fitting of the world and area they inhabit. They go alongside the host of other content spread across the world. Hunting camps will challenge all of your abilities and skills. Bandit outposts will task you with securing areas for people to live in safety. Corrupted zones, featuring machines turned mad through a strange corruption, need to be cleared. Of course, then there are the Tallnecks. This emulation of That Ubisoft Game© tasks you with climbing something to uncover a sector of the map. This reveals all of the tasks, yet to be found locations and if you’ve bought the maps from traders, where the few collectibles are found. These collectibles are actually fairly fitting for the world, and there aren’t too many of them. A handful of crafted figurines from one of the exploratory tribes found in the game. Unusual metallic flowers of a strange origin. Even artefacts of the old world. They have a place, they’re understandable and although they’re there as purely additional content, they never outstay their welcome and have a good payoff. Adding onto these are data logs, audio logs and areas of the past that can be seen through the use of your focus. This focus is your link to the machine world. 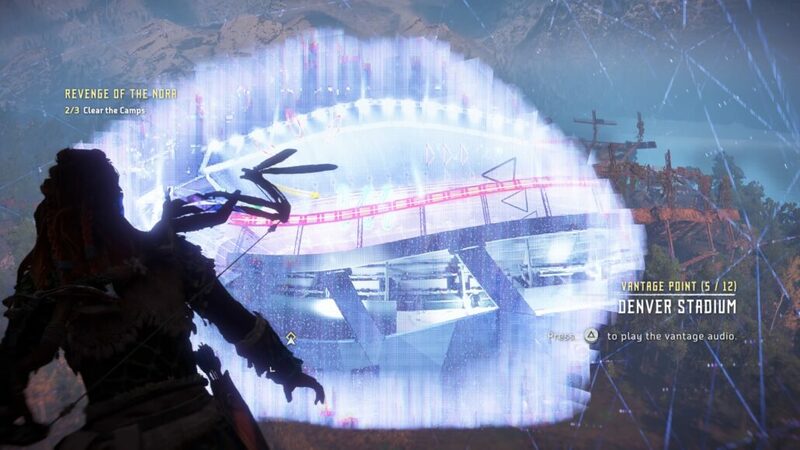 Found by Aloy as a child, it opens up the world map, lets her see the weaknesses of the machines, hack into them (once the relative cauldron has been completed) and see hidden aspects of the world in front of her. Think of it as detective vision or Batman vision. It just offers that look at the world beneath, or the past, it works in context with the story due to the use of technology. The story, and the fear of technology, also explains why most other people don’t use it. What needs to be reiterated is the simple fact that Horizon Zero Dawn has so much going for it. Aloy, amongst others, are outstanding characters. This is proof, not that we needed it, that a strong female character is more than viable. It’s also proof, not that we needed it, that your female lead needn’t just wear two strips of fabric and a thong. This is a world of equality. The Nora are a matriarchal tribe, other tribes do have a negative look on women. This is reflective of the world we live in. What is also reflective is the story arch, the growth of Aloy. There is also the growth of the Nora tribe, the story of acceptance. Aloy was an outcast, shunned. Even after saving the tribe and fighting for them, some still look on her as the outcast. This changes as the story looks into the meaning of creation, the purpose. This is an ambitious game that wants to, and successfully tackles a large number of elements in a way that most games could only dream of. Despite a few minor parts with cheesy aspects, it sincere and benefits greatly from that sincerity. Aided with exceptional voice acting by Ashly Burch, JB Blanc, Lance Reddick and more. This sincerity shines through, there’s heart, emotional contact with the characters and you can’t help but care. Even early on there’s a moment that is foreshadowed, but the emotional impact is there. It’s impossible to not love, hate or just feel sorry for some of the main characters as certain elements are uncovered. This is also a world of meticulous design, detail and purpose. Too many games throw in quests, collectibles and extras for the sake of content. Think of the hours it takes to complete without any thought of whether those hours had any purpose. Horizon Zero Dawn has purpose, every quest has a meaning, a point. It doesn’t reiterate itself to the point of causing boredom. It packs such a beautiful, well realised world full of things that you want to do, that makes sense. Not something that feels shoehorned in for the sake of it. It doesn’t hurt that Horizon Zero Dawn could very well be the best looking PlayStation 4 game to date. 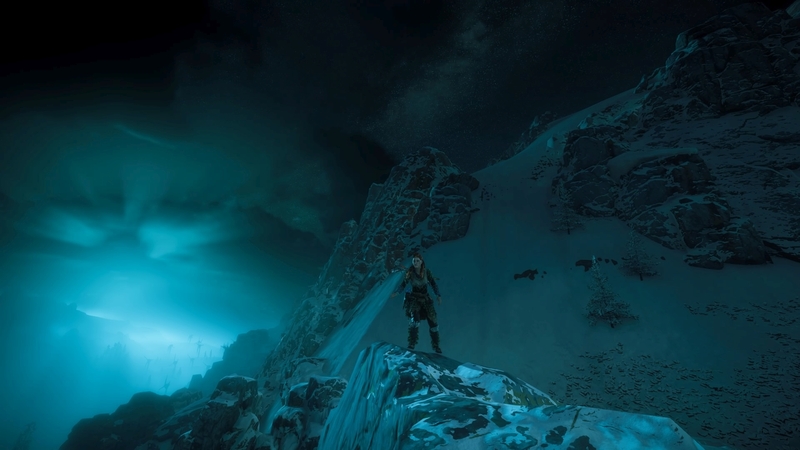 Guerrilla Games once again proved their technical mastery of the hardware. If you have a PlayStation 4 Pro and a 4K HDR display, it’s just magnificent at times and with a very solid frame rate. Even those who don’t have a 4K set can benefit from their PS4 Pro. When running at FullHD resolution, Horizon Zero Dawn gets supersampling as well as improved shadow maps and anisotropic filtering. Horizon Zero Dawn is excellent, I can’t emphasise that enough. This is a game that has made open worlds feel interesting again, in the way that The Witcher 3 managed to. This is something that has gone against the grain of games just aiming for a marketing spiel of “We have 100 hours’ worth of game”. You may not get 100 hours here unless you really like to explore and look at the scenery. What is certain, you’ll enjoy every single second you spend with Aloy. 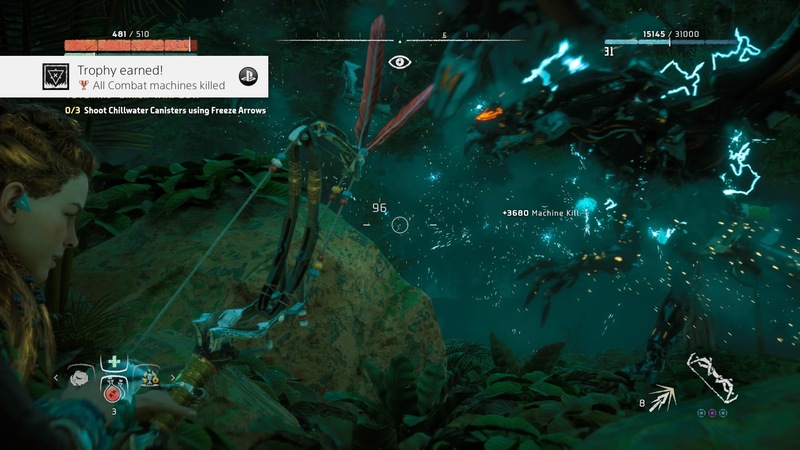 Horizon Zero Dawn is a pure sign of what can be completed with an exceptionally designed open world. Not only that, it has exceptional characterisation and a sincere story that doesn't shoehorn elements, allowing for the organic growth of characters. This is a game that I can barely find any faults with, except borrowing some elements from other open world games. Even so, it made each and every element its own in one of the best games to date.